It’s really strange to try to fathom how much my life is going to change once I’m in California, my little brother will go to college, and my retired parents move to Orroville (which happens to be the one point in the state farthest from any interstate highway in Washington state.) I’m trying not to think about how melancholy it is that this chapter of my life is quickly coming to a close…that a year from now if I come “home” to Seattle there isn’t going to be a home for me to come home to. 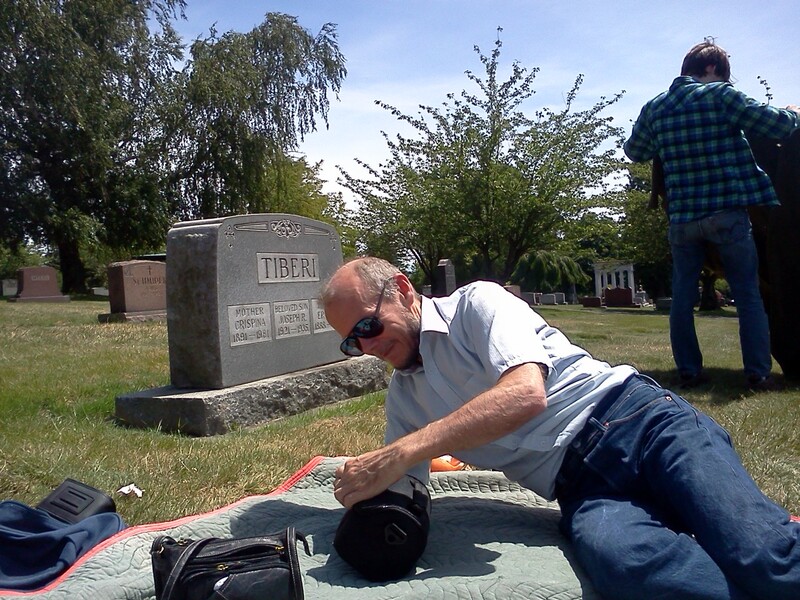 It was the solstice yesterday though, so my family decided to celebrate by picnicking in a graveyard. This is actually kind of a long-standing Greathouse family tradition. Back when we were in West Virginia we used to go to the graveyard all the time because there were so few other parks in Morgantown that were good for walking around. We would park at one end, walk across it, and get Hostess cupcakes at the store across the street to eat on top of nice gravestones. It kind of desensitized me to death at a young age in some ways, and it was weird when I went through this period as a pre-teen where I didn’t want to be in graveyards because it suddenly dawned on me how weird it was. I’ve since recovered from that stigma and made a bit of peace with my own mortality, so I’m good to eat and laugh on graves again. We had a crazy picnic. My Dad ate nothing but grapefruit, which is kind of par for the course these days, but the rest of us managed to pack balanced meals. We looked around until we found a nice name, and then spread out our picnic blanket over Crispina Tiberi. Most of the time these days, we go to graveyards when we think the parks will be crowded. In Washington, the first (nice) days of summer are always people-traps since the novelty of warm weather and clear skies is fresh and exciting again. The graveyard we were in was over by the University of Washington, so we could see the dorms my friends used to live in and the Space Needle to boot. Dad brought his binoculars. Afterwards, we did a stroll through Ravenna Park. We headed home, and in a strange reversal of sociality, Dad and Hasdrubal both had people to see and a party to be at. Mom and I stayed home and sorted the whole house, helping me pack a kitchen, gather spices, and make peace with the emblems of childhood that will vanish as she and Dad pair down their belongs and prepare to move into a cozier house somewhere in Eastern Washington. My life is packed up in cardboard boxes now, making a faint existential scratching noise from inside. Dad unpacks a camera, while my little brother Hasdrubal spreads another blanket.